The International Polar Years (IPY) are collaborative, international efforts with intensive research foci on the polar regions. Karl Weyprecht, an Austro-Hungarian naval officer, motivated the endeavor in 1875, but died before it first occurred in 1882–1883. Fifty years later (1932–1933) a second IPY took place. 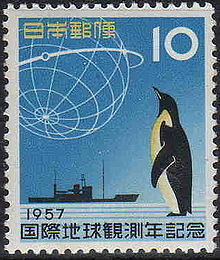 The International Geophysical Year was inspired by the IPY and was organized 75 years after the first IPY (1957–58). The fourth, and most recent, IPY covered two full annual cycles from March 2007 to March 2009. 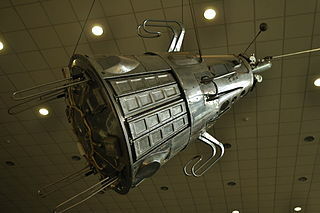 Vanguard TV3, also called Vanguard Test Vehicle Three was the first attempt of the United States to launch a satellite into orbit around the Earth, after the successful Soviet launches of Sputnik 1 and 2. Vanguard TV3 was a small satellite designed to test the launch capabilities of the three-stage Vanguard and study the effects of the environment on a satellite and its systems in Earth orbit. It was also to be used to obtain geodetic measurements through orbit analysis. Solar cells on Vanguard TV3 were manufactured by Bell Laboratories. The Casey Station, commonly called Casey, is one of three permanent bases and research outposts in Antarctica managed by the Australian Antarctic Division (AAD). Casey lies on the northern side of the Bailey Peninsula overlooking Vincennes Bay on the Budd Coast of Wilkes Land in the Australian Antarctic Territory, a territory claimed by Australia. Casey is 3,880 kilometres (2,410 mi) due south of Perth, Western Australia. Albert Paddock Crary, was a pioneer polar geophysicist and glaciologist. He was the first person to have stepped foot on both the North and South Poles, having made it to the North Pole on May 3, 1952 and then to the South Pole on February 12, 1961, as the leader of a team of eight. The South Pole expedition set out from McMurdo Station on December 10, 1960, using three Snowcats with trailers. Crary was the seventh expedition leader to arrive at the South Pole by surface transportation. He was widely admired for his intellect, wit, skills and as a great administrator for polar research expeditions. James Alfred Van Allen was an American space scientist at the University of Iowa. He was instrumental in establishing the field of magnetospheric research in space. The National Snow and Ice Data Center, or NSIDC, is a United States information and referral center in support of polar and cryospheric research. NSIDC archives and distributes digital and analog snow and ice data and also maintains information about snow cover, avalanches, glaciers, ice sheets, freshwater ice, sea ice, ground ice, permafrost, atmospheric ice, paleoglaciology, and ice cores. The Scientific Committee on Antarctic Research (SCAR) is an interdisciplinary body of the International Council for Science (ICSU). Operation Moonwatch was an amateur science program formally initiated by the Smithsonian Astrophysical Observatory (SAO) in 1956. The SAO organized Moonwatch as part of the International Geophysical Year (IGY) which was probably the largest single scientific undertaking in history. Its initial goal was to enlist the aid of amateur astronomers and other citizens who would help professional scientists spot the first artificial satellites. However, until professionally manned optical tracking stations came on-line in 1958, this network of amateur scientists and other interested citizens played a critical role in providing crucial information regarding the world's first satellites. The ISC World Data System (ISC-WDS) was created by the International Science Council's (ISC) General Assembly in October 2008. ISC-WDS goals are to preserve quality assured scientific data and information, to facilitate open access, and promote the adoption of standards.